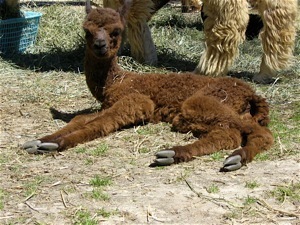 Alpacas do not have hooves—each foot has two toes, and a soft pad, much like a dog’s paw—so there is no compaction of the soil to the same degree that would occur with other types of livestock. 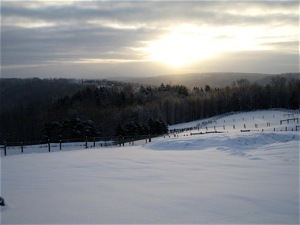 As our farm is on the top of Mill View Mountain, we get lots of snow. 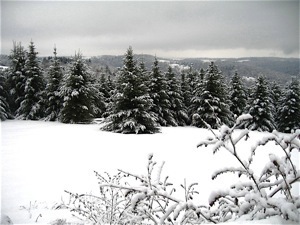 Our tree farm is especially beautiful in new-fallen snow. Winter is generally a quiet time on the farm. 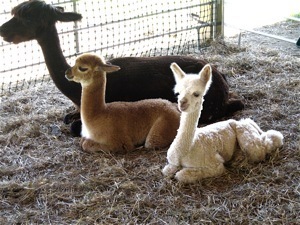 We take this opportunity to plan for the all the events in the spring such as shearing, birthing, breeding, and having a great time with our alpacas. 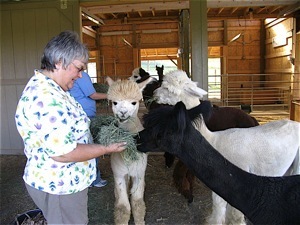 Regina Miller, our “alpaca wrangler,” has been around animals all her life. She loves tending our herd, and they love her (and not just because she is holding their favorite hay: delicious orchard grass)! 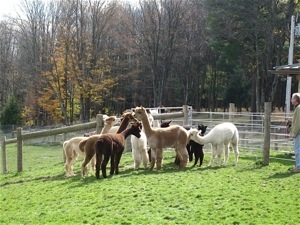 Whether the newcomer to the herd is an older individual or a newborn, the herd gathers around to meet and greet and get to know the new herd member. The new addition is generally accepted, and almost immediately is comfortable in his or her new surroundings. Milana Alyssa, above left, joined us when she was seven years old, but became accustomed to her new digs very quickly. 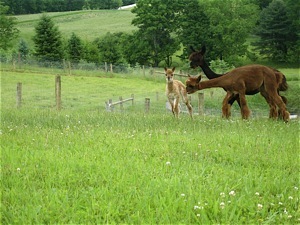 A few hours after he was born, Cleremont (Monty) was introduced to the herd by his watchful dam, Chablis. 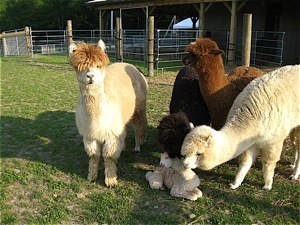 The girls are very gentle with their sniffing and poking, and soon were satisfied that the new addition was, indeed, an alpaca. 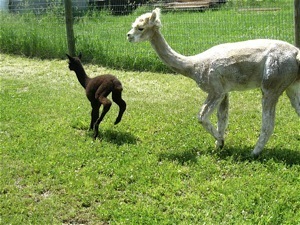 Chablis brings her newborn out into the sun and fresh air. Crias (babies) are usually born in the morning or early afternoon so they can dry off and become acclimated to their new life before darkness falls. 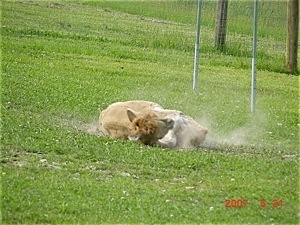 Dustbaths are a popular way to scratch the occasional itch, but we also feel that they just love to roll around in the dirt. Brandywine has produced three daughters for us, Alice, Margeaux and McKenzie. In the photo above left, Brandy and her daughters romp in the cool breezes of a summer evening. Family groups recognize and relate well with each other. In the above right photo, Brandy stands stock-still for Margeaux to nurse. Both of these photos were taken the day Margeaux was born. 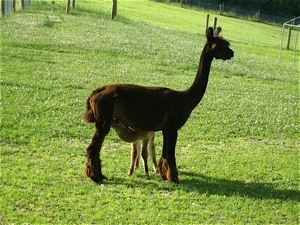 She was up and running with the herd within a few hours of her birth. 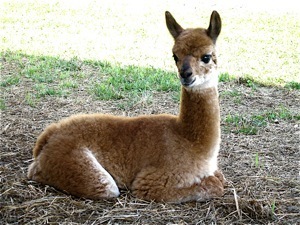 Margeaux is a beautiful vicugna-patterned girl, with incredibly fine, soft fleece that is a joy to spin. She also loves to be the center of attention, always being ready to have her photo taken! 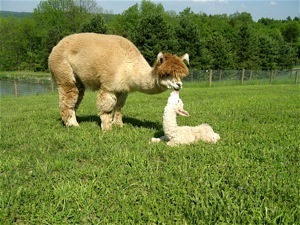 New mother Susquehanna Farm’s Macarena, has her “hands” full with a very active new born cria. “Mephisto’s Jax” was born on June 6, 2008, and is a handsome future herdsire, following in the footsteps of his grandsire, the famous Mephisto! We keep the girls separated from the boys to prevent unwanted attentions from amorous males. All our breedings are planned with specific males and females, as we try to maximize good qualities and minimize the less desirable. 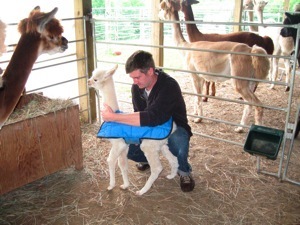 Adam is fitting Aasta with her very stylish “cria coat” as insurance against a chilly night. She is one day old in this photo, and because her body is not yet able to regulate temperature, we feel that the use of a coat is good husbandry! 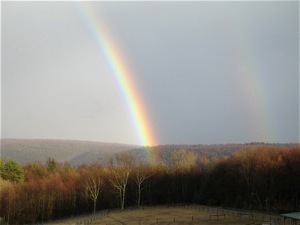 Double rainbows are common here on the mountaintop, and every one is inspiring. Here, Margeaux and Monty sit quietly with Brandy. Monty has been shorn, but Margeaux had to wait until the next spring for her first shearing. 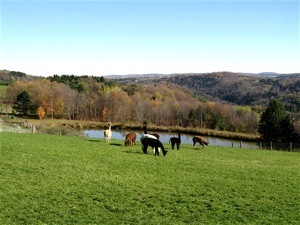 Alpacas enjoy fresh air and sunny weather as much as humans. 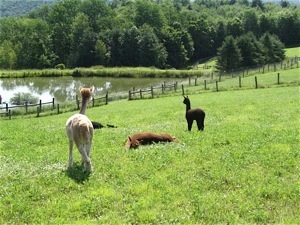 Here a few girls are snoozing in the sun while a few others, including three week old Jax, take in the view. 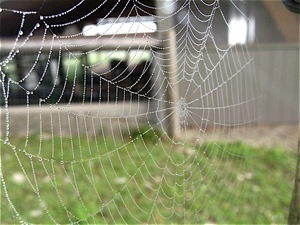 A beautiful dewey spiderweb woven right outside the barn.